A herb and a spice! That's what you get when growing cilantro. And, if you live somewhere with a regular climate, growing this delicate herb is fairly easy and straightforward. The fresh leaves are great for cooking and the fragrant seeds are great for numerous spice blends and rubs. 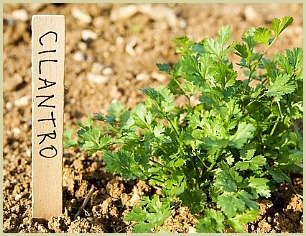 General Notes: The delicate cilantro plant is best when grown in fertile, well-drained soil in a sunny spot. It's an annual so you'll have to renew each year. Incidentally, here in the UK the whole plant is commonly called coriander. I think for the rest of the world, the actual plants are known as cilantro, and the seeds are the coriander part. Read more about the seeds. A few weeks before the average date of the last frost, sow 15-20 seeds in a 5-6 inch (12-15cm) pot in general potting compost. Water, and after 7-10 days they should germinate. A temperature of 15-21°C (60-70°F) is ideal. 2 weeks after the last frost you can transplant the whole pot outside. Try to not disturb the roots too much. 2-3 weeks after the last frost date in your region sow the seeds in well-draining soil a ¼ inch deep in shallow drills 8-12 inches (20-30cm) apart, water and in 7-10 days they should have germinated. ...If you want to grow to harvest the leaves thin to 2-3 inches (5-8cm) apart. If it's the seeds you want, thin to 9-12 inches (23-30cm) apart. For a steady supply of leaves throughout the growing season, sow new seeds about every 4-6 weeks. This herb is thrives in large pots or containers in a sunny spot or patio. It needs to be well-draining, so add some pebbles or broken pot to the bottom of the container. After the last frost, using a general potting compost, plant out any young plants you may have grown indoors in pots. Preferably only water between morning and early afternoon. Alternatively scatter 30-50 cilantro seeds on top of some potting compost and cover with ¼ inch more compost. Water between morning and afternoon, and in a week or so they should have germinated. In a few weeks you will be able to harvest the young leaves. Note: I have 4 containers and I start a new crop every 4-5 weeks before replacing the 1st container. This way I have fresh leaves from early spring to late autumn. You can pick and use the young leaves as soon as the plant is 5-6 inches tall. For the seeds; wait until the seed heads dry on the plant then cut the stalk low down before covering 5-6 of the seed heads with a paper bag and sealing with an elastic band. Hang them upside down in a warm, dry place (greenhouse is ideal), and after 10-14 days the seeds will drop off. Give them a shake if necessary. Store in an airtight jar. An added bonus when growing herbs is the health benefits the fresh leaves and seeds come with. This herb is no different. Read more on the health and well-being benefits. Early Spring: Sow seeds indoors in pots. Spring: Sow seeds outside. Plant out plants that were grown indoors. Summer: Sow more seeds. Stake plants if necessary. Autumn:Sow last batch of seeds Winter: Dig over ready for spring. Fast growing, in just a few weeks you'll be chopping and enjoying the delightful fresh leaves in your cooking. This root is often used in Thai cooking, usually as a base for pastes like the well known Thai green curry paste.